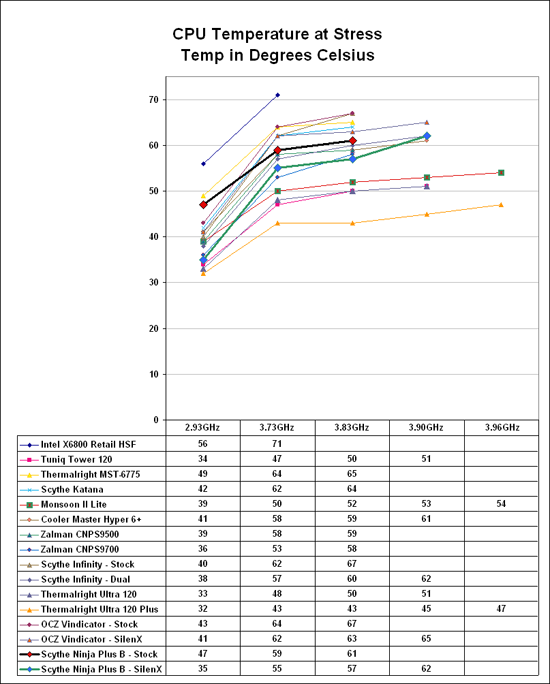 The Thermalright Ultra 120 Extreme has been the top performer so far in CPU cooling at stock speeds. As overclocks are raised, the Ultra 120 with the Scythe SFLEX fan maintains its cooling advantage. The Scythe Ninja Plus B is average in cooling efficiency with the stock fan. However, a swap to the specified 14 dB-A/72 CFM SilenX fan improved cooling to the levels of the top tier heatpipe towers in our reviews. At 2.93GHz the retail HSF is running at 41C, compared to 31C with the Scythe Ninja Plus B with the stock fan.. This is a delta of 10C. The SilenX drops that temperature to 27C, or a delta of 14C. The delta with the stock fan remains about the same as the overclock increases. At 3.73GHz the idle with the retail fan is 56C compared to the Ninja stock at 47C - a delta of 9C. Performance improvements are much greater with the SilenX fan on the Ninja Plus B. At 3.73GHZ the SilenX cools to 36C, while at the highest stable overclock of 3.90GHz the Ninja/SilenX is at 42C. This almost flat line at idle at the top of our testing is an indication the SilenX is effectively cooling at idle all the way to the top speed that could be reached in benchmarking. Cooling efficiency of the Ninja Plus B, with stock and SilenX fans, was next tested under load conditions. 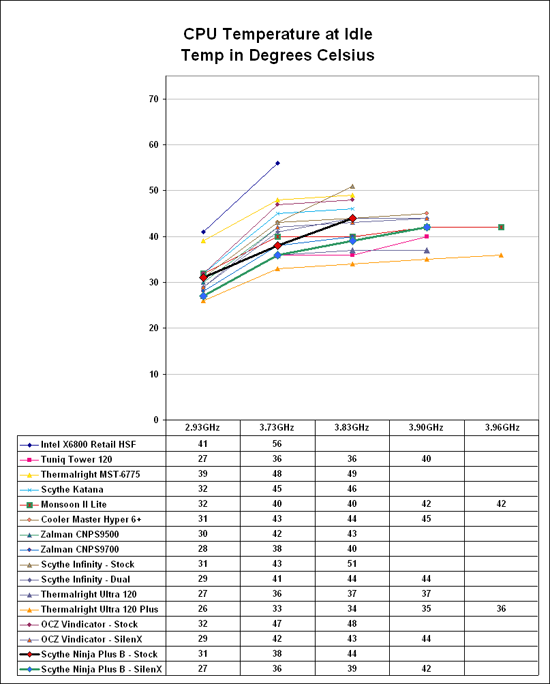 Results are compared to the retail HSF and other recently tested CPU coolers. The Scythe Ninja Plus B with the SilenX fan generated results almost identical to the Scythe Infinity with Push-Pull fans and reached the upper tier of overclocking performance. Results with the stock fan were average. By 3.90 GHz - the highest overclock the Tuniq, Thermalright Ultra 120, OCZ Vindicator, and push-pull Scythe Infinity could reach with stability - the Ninja Plus B is at 62C with the SilenX fan. This is still worse cooling performance than many of other top coolers at this speed. Push-pull SilenX fans lower this only a couple of degrees more - to 60C. The Tuniq and Ultra 120 are both at 51C, which is some 9C to 12C lower than the Ninja Plus B. However, the Scythe was completely stable at 3.90GHz with the SilenX fan even though it ran a bit warmer. The single stock fan could only manage 3.83GHz so the SilenX or dual Sythe low-noise fans in push-pull configuration are much better fan setups for overclocking the Ninja Plus B. As stated many times, the overclocking abilities of the CPU will vary at the top, depending on the CPU. This particular CPU does higher FSB speeds than any X6800 we have tested, but the 3.9GHz top speed with the top tier heatpipe towers is pretty average among the X6800 processors we have tested with Tuniq cooling. A few of the other processors tested with the best air coolers reach just over 4 GHz, but the range has been 3.8 to 4.0GHz. Stock cooling generally tops out 200 to 400 MHz lower, depending on the CPU, on the processors tested in our lab.